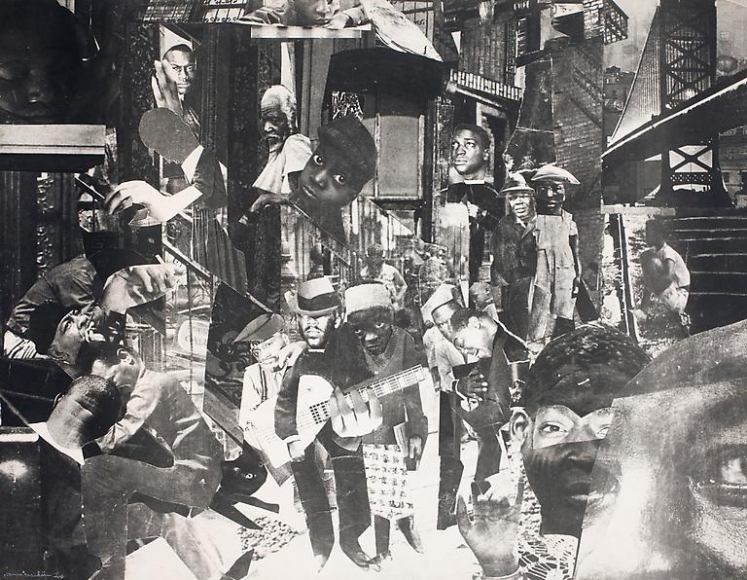 Romare Bearden, an African-American artist and writer, is renowned for his collages and photomontages a technique he began to experiment with in 1950s, establishing his reputation as a leading contemporary artist. Bearden’s work reflects his improvisational approach to his practice. He considered his process akin to that of jazz and blues composers. Starting with an open mind, he would let an idea evolve spontaneously. “You have to begin somewhere,” he once said, “so you put something down. Then you put something else with it, and then you see how that works, and maybe you try something else and so on, and the picture grows in that way.” Bearden’s approach was intuitive, an ongoing dialogue between tradition and innovation. 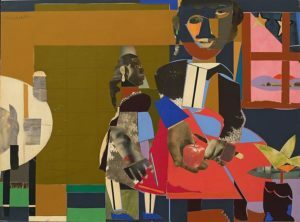 Born in 1911 in Charlotte, North Carolina, Romare Howard Bearden moved with his family to New York City when he was three years old. After attending Lincoln University and Boston University, he graduated from New York University with a degree in education. He studied drawing and painting with George Grosz at the Art Students League of New York and in the 1930s and 1940s became close friends with several older artists, including Stuart Davis, who was an important mentor. In 1935, Bearden joined the Harlem Artists Guild and began contributing political cartoons to the weekly Baltimore Afro-American. 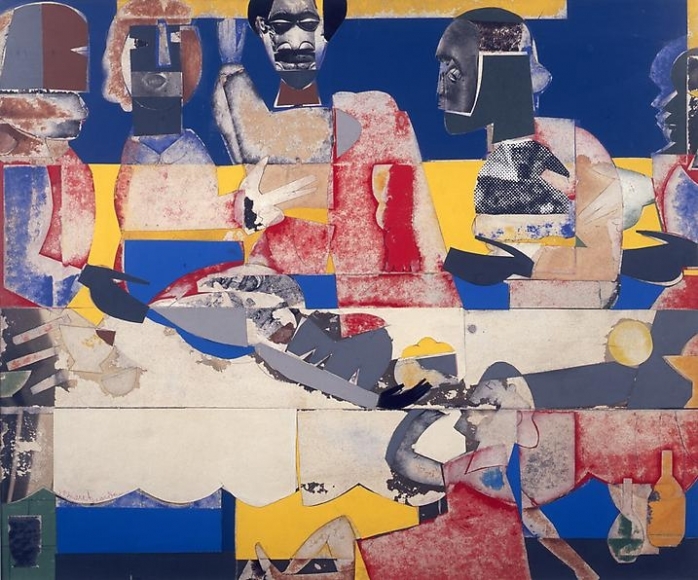 Bearden’s career as a painter was launched in 1940 with his first solo exhibition in Harlem and then another, four years later, at the G Place Gallery in Washington, DC, while he was serving in the Army. In 1945, shortly after his discharge, he joined the Kootz Gallery on 57th Street, and exhibited there for the next three years. He then traveled to Paris on the G.I. Bill in 1950 where he studied philosophy at the Sorbonne. Upon his return home to Harlem, he married Nanette Rohan in 1954. Two years later, they moved to a loft on Canal Street. 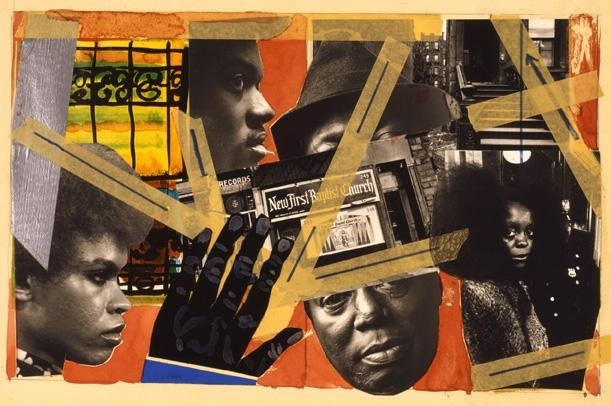 After a few years painting abstractions in the late 1950s and early 1960s, Bearden turned to photomontage and collage, which established his reputation as a leading contemporary artist. He joined the Cordier & Ekstrom gallery in 1961, and was represented by them for the rest of his life. In 1963, Bearden, Hale Woodruff, Charles Alston, Norman Lewis, and others formed the Spiral group in order to promote the work of black artists and explore ways in which they could contribute to the ongoing civil rights movement. In a further expression of his lifelong commitment to the African-American art community, he, Lewis, and Ernest Crichlow later established the Cinque Gallery, dedicated to supporting and exhibiting the work of emerging black artists. Bearden was a founding member of the Studio Museum in Harlem and the Black Academy of Arts and Letters. In 1964, he was appointed the first art director of the Harlem Cultural Council, a prominent African-American advocacy group. He was elected to the American Academy of Arts and Letters in 1972. He died in New York City in 1988.